Sydney, NSW, Australia, 2018-Jan-15 — /EPR ENERGY NEWS/ — When you need to recharge yourself and your 12V system, look no further than an Adventure Kings Solar charging system. We have pioneered a range that starts from a simple 10W USB solar charger to a fully fledged 250W output array with MPPT Regulation for absolute maximum output to give you the options to power your setup no matter what you take camping with you. All Adventure Kings Solar panels use Monocrystalline silicone cell construction which is the most efficient panel design available remaining lightweight and compact whilst still outputting effective power for use at home or in the bush. We have fully standalone systems that include a solar regulator in both hard framed designs or the more flexible folding solar blankets which are excellent for space saving in the back of your vehicle or for emergency use. We even have a fully customisable 110W Hard mounted system that includes fittings so you can easily and permanently mount it to your vehicle, camper trailer, campervan, caravan or boat with your choice of solar regulator. We stock both the easy to operate low cost PWM style of regulator that has become the standard across the industry, or you can upgrade to one of our high efficiency, high output MPPT style regulators which gives you up to 30% more efficiency in cloudy or overcast conditions ensuring you get the most out of your solar setup no matter what the weather conditions. Adventure Kings maintains its reputation for supplying functional camping setups whilst also still offering some of the most affordable solar setups available to the Australian market! Whatever your 12V setup, Adventure Kings has a Solar charging system to efficiently top up your batteries and run accessories, with zero running costs and zero noise, whilst you kick back and relax and enjoy your favorite campsite in peace and quiet….When you are looking for a solar panel setup, you can’t look past an Adventure Kings Solar setup. When you’re building a tourer or planning a campsite in your head, solar panels should always be a consideration – they are a source of free, limitless power after all – but how do you know what panel to choose!? Luckily Adventure Kings has a wide range of panels, that won’t break the bank. There are two main considerations to make when choosing a solar panel – how much power you use and how much space you have to pack your panel/s. First, to calculate your requirements, consider how many 12 volt accessories you use at camp. Generally all electrical products will have a wattage listed (check for a sticker near the power cord) you can use this wattage to calculate the real-time amps the product will use while it’s on. Some products may also list an Amp/Hour rating which simply gives an average on the total amount of amps used per hour the product is turned on. For example, the Adventure Kings 60L fridge/freezer is rated to use less than 1 amp/hour when the interior is set at 5°C and the outside temperature is 32°C. You arrive at camp at 6pm on Friday, and it’s 32°C – your fridge is down to temperature at 5°C thanks to being plugged in while you drive and you’re ready for an icy cold beverage while you light the campfire, roll out your swag and set up the awning. Then you set up an Illuminator Strip Light and as the sun sets you turn it on and wind it down for ambient light. So between 6pm and 8am you used 14 Amps total – whether you have a 98AH or 115AH deep cycle battery you’ve still got plenty of juice. But throughout the next day your fridge will continue to use power. Between 8am Saturday and 8am Sunday it will use another 24 Amps. Add another 5 hours of strip light use for 2Amps and add in a phone charge using a cig socket USB adapter rated at 12W – that’s another Amp per hour your phone is on charge. In this case your phone is charged in 2 hours so that’s another 2Amps. Plus you use your Thumper to inflate some inner tubes to relax and float in the river – you use your Thumper for 15 minutes. To calculate the amps used per hour, you find the instantaneous power listed on the sticker (45Amps) and because you’ve used it for a quarter of an hour, calculate one quarter of 45. For this example we’ll call it 12Amp/Hours. So Saturday to Sunday morning 8am you’ve used 40Amp/Hours – combine this with the Friday night total 14Amps and you’re looking at 54Amp/Hours – at this point your Deep cycle battery has used over 55% capacity if you’ve got the 98AH battery, and over 46% capacity if you’re using a 115AH battery. You’re planning to leave camp at 4pm so the fridge still needs to be powered by your battery for a further eight hours. That’s another 8Amp/Hours, bringing the total weekend use up to 62Amp/Hours. 63% of your 98AH battery and 53% of your 115AH battery – you should definitely add a solar panel to keep those batteries charged! Now you can look at the output of the different solar panels available. 4WD Supacentre offers a 110W fixed solar panel, a 120W Folding Solar blanket (with PWM regulator) a 160W Folding solar kit (with PWM regulator) and a 250W folding solar panel kit (with PWM regulator). The table below shows their maximum charging amperage (assuming the same PWM regulator for all panels) as well as the estimated total Amp/Hours after 6,8 and 10 hours of sun light. So even six hours of sunlight on the Saturday and Sunday and your battery will have recharged at least 72A/H with a 110W Fixed Solar Panel (with added PWM regulator.) This would cover your power usage and keep your batteries charged. Of course, this is only a guide and your actual consumption may vary depending on many factors including, but not limited to, the outside temperature, fridge temperature, battery condition, wiring size and condition, solar panel angle and position etc etc. The second consideration is the amount of space you have in your vehicle – for smaller vehicles, a 120W portable Solar blanket is perfect as it packs down to a compact size and still packs a punch. 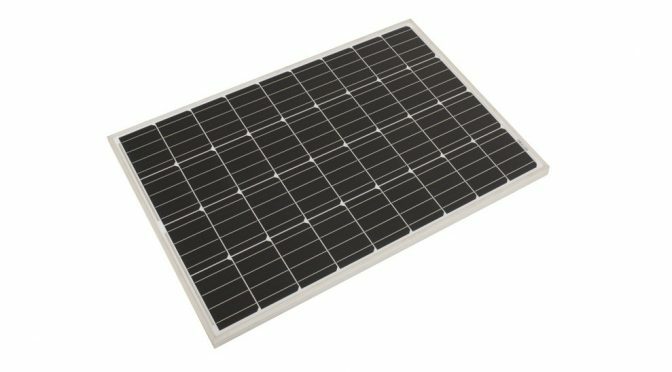 For permanent mounting solar panels, the choice is obvious – a 110W fixed solar panel (or two!) These feature a thicker aluminium frame and don’t come with a regulator so you can connect your own, use a DC to DC charger and even connect multiple. For bigger vehicle where space is less of a priority a 160 or 250 watt folding solar panel is ideal. You can set these at varying angles to catch the sun, and they mean you can park in the shade and have your panel in the sun doing the hard work! They also provide plenty of power for bigger camp setups or hotter conditions where your fridge is working more to keep your drinks cool.